Welcome to MyCreativeStirrings.com! I hope you enjoy my Can of Dates! It seems to have become quite popular. I just wanted to let you know that this is my creative idea but not my only creative idea, I have over 300! Everything is created by me, this is not a collection of other peoples ideas, so I hope that every idea you find here is unique and a fun new find! PS - I have more date ideas and additional designs for the Can of Dates for sale on Etsy. Check out other date ideas, recipes, crafts, cheap but great gifts, etc. by clicking on the word in this sentence or by clicking on the label list in the right hand column. If you want another version of this idea geared towards Anniversaries look at my Time Capsule gift idea. Again, welcome and feel free to comment or follow and we hope you visit again often! I attended a wedding where I gave a gift card with a little extra fluff :). Gift cards are always exciting to receive. However, adding a little extra effort hopefully allowed my gift card gift to be that much more fun. 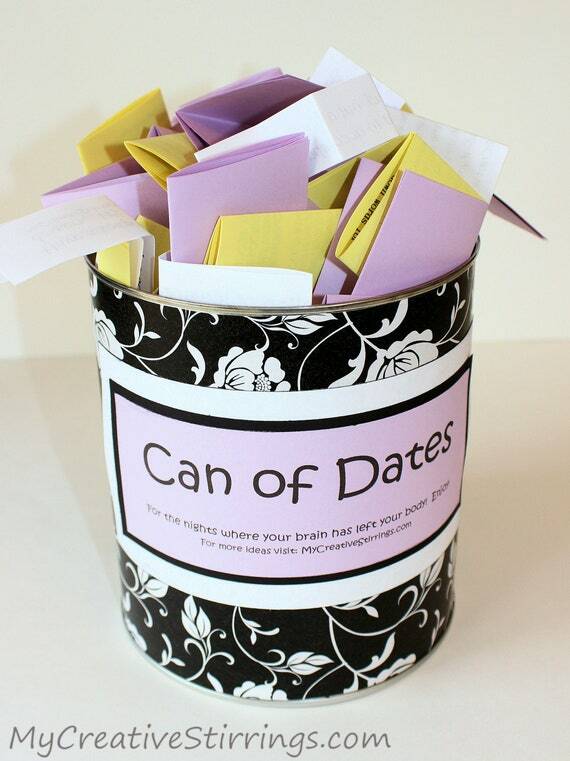 So, I came up with the "Can of Dates". This gift could cost as little or as much as one desires! 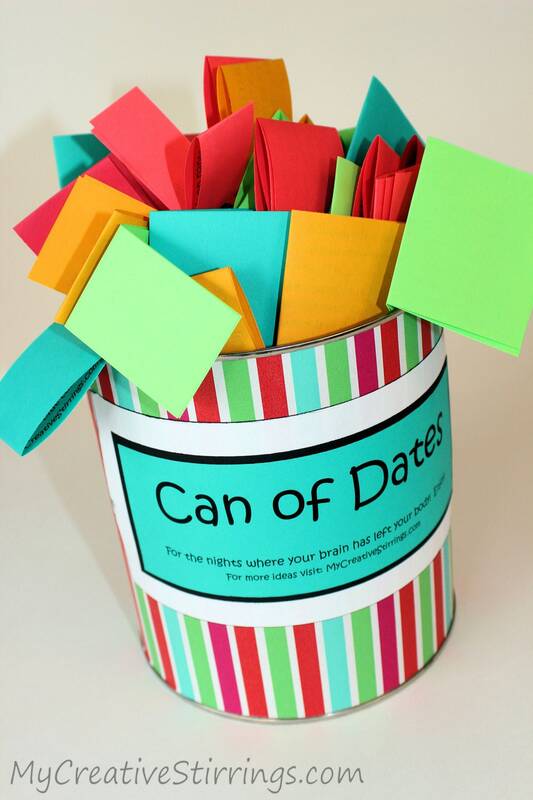 I typed up many date ideas that I printed off on colored paper and folded up to fit into my can. Some of the date ideas involved additional items that could easily be tossed into the can as well. If you felt generous you could give a series of gift cards, money, or items to use on a date. Haven't we all had crazy nights where we wish someone would do the thinking for us! Hopefully this can will help create fun memories that will last a lifetime! 1. Start a Sweetheart Journal! Cut out this poem and place it in an empty notebook or journal and start writing! Its use should be shared between two. To the one you adore, love, and often dote. And wait for a reply that will tickle your mind. You have only your spouse's heart to be won. 2. Have each person design and make a boat out of things around the house. Then, take them to a river/stream and race them. 3. Walk to a local bakery or cupcake shop. There is something about walking to a bakery with someone you care about…maybe because I am obsessed with food? If you do not live next to a bakery then surprise your sweetheart by parking a few blocks away and packing a back pack with a blanket, games, fun drinks... If you go to a cupcake shop make sure you get a few varieties and share them. 4. Date in a box- Pick a random box or container (you could decorate it if you are really ambitious). Put items in the box that you could do on the date (food, games, tickets, ideas…). After the date give the box/container to your partner and tell them that it is their turn! 5. Go shopping for umbrellas. Choose a few stores that you think would sell fun umbrellas and stop in. Don't be shy...open all of them inside. It will make you feel like kids again. 7. Greeting Card Date- Have you ever wanted to accomplish something productive while on a date? Do you send out birthday/anniversary/holiday cards to family members or friends? If so, go to the Dollar Store (all cards are $.50) and quickly pick out the total number of cards you need for the year. Don’t think about each card, make it random (i.e. giving a “Congratulations on your 90th Birthday” to someone your age or “You’re a special boy” to your dad). The more random the more giggles you will later have. Once at home assign a card to each person and file away. Have fun! 8. Living Room Camp-Out- Get anything you have that makes you feel like your camping out and set it up in your living room (i.e. camping chairs, turn off the lights and use flashlights, blanket…). Make tin foil dinners in your oven for the dinner. Search the internet for unique tin foil dinner recipes. 9. Wishing Well Date- Get a roll of pennies or gather pennies from around the house. Go to a fountain and make wishes together. 10. Random Word Date- At the start of your date ask your partner to come up with a random word. It can be as long or as short as they desire. Using the following list (or make up your own) take the word and assign each letter of the word to an item on the list. Do not change the order of the word or the items to keep it spontaneous! Then, come up with a way to fulfill each item that begins with the letter you assigned to it. For example if you partner came up with the word "tomato" you could wear (T) tunic's on your date or wear teal colored clothes. You could eat at a restaurant that starts with the letter "O" or eat something that starts with that letter. If the word your partner comes up with is longer or shorter than your list you could repeat an activity or take something out. Eat at a restaurant or make your own food "O"
12. Video Date- Have a video date where you take turns asking each other a series of questions. This would be a fabulous gift to your children in the future. It may even be fun for the two of you to re-watch. Haven't you ever wondered what your parents body movements or facial expressions were like when they were your age? Record something now because you never know when the chance will be gone. It should be fun! You could come up with your own questions or use mine. Have fun and be creative! 1. What was your home town like? 2. How well did you get a long with your siblings, parents, teachers? 3. If you could re-do anything from the past what would it be? 4. What were you like in grade school, junior high, and high school? 5. What are some of your happiest memories from your childhood? 8. What are 2 of your favorite breakfasts, lunches, dinners, snacks, and desserts? 10. How did you meet mom/dad? 11. Name three of your favorite traits of mom/dad? 12. List two of your favorite traits of each child or share your favorite memory of each child. 13. What is the craziest thing you have ever done? 15. What is your happiest memory. 16. What was college like? 17. List three pieces of advise. 13. Letter Date- Need a random date night idea that will keep things spontaneous? Ask your date to pick a letter in the alphabet. With that letter base all food, activities, dress, and conversations. Example- if your date picked the letter A and to fulfill the Food category you could eat apples (find a unique way to cook them like grilling or baking), artichokes, drink ale (ginger ale), or go to Applebees. Activity- you could incorporate astronomy, aliens (watch a movie, create some fake alien markings to trick your kids), do something athletic or artistic... Dress- wear something your ancestors would, be naked and explore anatomy (just kidding), or wear something abstract (non-matching). Conversations- talk about automobiles, apes, art, the army... This date could very easily be done at home! Feel free to use a dictionary. 14. Check out movies from the library. They have a good selection and they are free! 15. Make Chocolate Bowls to hold individual servings of ice cream. Get small blow up balloons from the store and blow some up (one per bowl). Melt some chocolate (chocolate chips work great) in a bowl in the microwave (check and stir it every 30 seconds). Next, pour a little puddle (~2 inches in diameter) of chocolate onto some wax paper or a small plate to act as the stand. Then, dip the balloon into the chocolate a few times to create your bowl shape. Allow it to dry on top of the stand. Once it is dry then make a small slit in the balloon and slowly allow the air to escape. Remove the shriveled balloon and serve ice cream in your bowl. 16. Message in a Bottle Bubble Bath- Buy a decorative small colorful bottle with a cork. Write a nice love letter on a piece of paper with burnt corners. Roll the paper, put it in the bottle, insert the cork and throw it into a bath, full of water, essential oils and bubbles. You could join him if you’re feeling stinky! 17. Go to the dollar store and each of you pick out an activity to do on a date. Don’t peak until you are through the checkout line. 18. Repeat your first date as closely as you can. 19. Photograph Safari- Take a digital camera and go on a "photo safari." Drive/walk around town, taking pictures of places where you shared fond memories, or sites that were comical. 21. Fondue Party. You can use small crock pots, fondue pots, or a microwavable bowl that you can continuously re-heat. Plan a meal around sauces that you would want to dip foods into. i.e cheese sauce (dip- breads, vegetables, meats); chocolate (dip- cheesecake, marshmallows, cookies, strawberries, bananas, pineapple, pretzels); broth or sauce for meats; marinara sauce (dip- sausage, cheesy garlic bread, pizza without sauce, bread sticks…). It is probably easier if you do this with other couples as it can get expensive and you’ll have more of a variety. If you do it with one other couple you could assign one dip with the appropriate sides per couple. 22. Popcorn Fun- Pop a few bags of popcorn and allow each person to come up with 10 ways they can use popcorn. If you get desperate use the internet! 24. Group Activity- before the date ask someone who will not be attending the date for delicious dinner ideas. Then ask them to type up the recipes making sure to include all the ingredients but leaving out chunks of instructions. For example- Don’t tell the group what any of the recipes are called. If you are making a salad you could leave out what to do with a can of beans you are suppose to add… The couple won’t know if they should rinse the beans, blend them… Put the recipes missing parts in one envelope and the recipes with all the information in a second envelope so that after you have made the food you could check how well you did. I have done this and the food all tasted great even though it was all made differently than how it was suppose to be made. We went to the grocery store to purchase as a group as part of the date. 25. Have a soap carving contest. 26. Check out a book on paper airplanes, practice making them, and have flying contests. 27. Check out a book on origami and fold away! Make an Asian treat to accompany the fun! 28. Make a time capsule of you and your spouse to give to your future children. If you can spare a few dollars put them in for a “fun family” activity! 29. During the week find a way to surprise each other. i.e.- Put notes in all their socks, write a note on the mirror using lipstick… Be creative and try to think of something new! 30. This may sound lame but it is essential! Tell each other 3 reasons why you like each other. Then hug . Just kidding…well you can if you want. 31. Using children’s fridge magnets, alphabet blocks, or alphabet cereal write a note to your spouse for them to see when they come home. 32. Write down a list of 15 words that describe your spouse. Frame them, put them on the fridge, or tuck them into your sweetheart journal. If you do not know what a sweetheart journal is then you have not yet found that paper in these ideas. 33. Look up some fun personality tests on-line. 34. Write your parents thank you notes and include your hand prints! Tell them that you expect them to hang your art pieces on their fridge like old times. 35. Check out old cartoons from your childhood and make your favorite childhood treats! Have fun reminiscing! Warning- they may not taste as good as what you remember. 36. Give each person a half gallon of ice cream and a variety of kitchen utensils. Then, have an ice cream carving contest. Depending on your competitiveness have a neighbor be the judge. I found this cute post via Ucreate. I'm your newest follower via Google Friend Connect. Totally going to do something like this for my wedding clients!! I think it would be soooo fun for them with all the chaos of planning a wedding!! I came across this from Ucreate - what a great idea! I am hosting a shower for a friend this summer with the theme of "Let's Make a Date." We are asking everyone to bring a gift that the couple could use or do on a date (tickets to theatre, gift cards, wine & a movie, etc.) and I will definitely be including your "Can of Dates!" Thanks for a great idea! Very cool. Thinking about doing this for Christmas when I give gift cards this year for the first time to all the couples. I found this randomly on Ucreate and it's one of the best ideas I've heard for a wedding gift ever! I am also totally giving this to my husband for our anniversary. The date ideas themselves are the best part! So cute! this is such a fun idea-I am hoping to make something like this for my hubby's birthday. I know this was suppose to be inspiring a gift, but I am SOOOO camping out in our livingroom this weekend thanks for the great ideas lady! Stop by my blog when you get a chance I am doing a give-way all you have to do it comment to win! This is SO cute! I love it. I'm going to use your idea for a shower this weekend! Forget about weddings. I'm going to start now and work on making this for my anniversary! It will be 6 years in December (I know a ways off). But we have two small children and my husband is in grad school. So not a lot of time or money. This will be the perfect way to show him how much I love him and how I still love spending time with him! Great Idea!! I am going to a wedding reception this weekend and was trying to come up with something creative! Thanks for the help! While I am at it I am going to make one for my husband and I! totally stealing and will be giving this away on Saturday!!! found this through The Dating Divas. Fabulous ideas! I so want to make this! I also found this through The Dating Divas website. I absolutely love this idea! I am making one for my husband and I, and also one for my sister and her boyfriend. I will be making these as gifts for all of my friends. Thank you for the great idea!! Thank you for this idea. It's awesome I will be making one for my husband and I as well as my friends. This is awesome. I'm going to put this in my husband's stocking as a big 'hint' for him. He always seems to think dates have to be expensive and elaborate, so we don't go very often. These are great, cheap ideas! My husband and I are both college students and can't really afford to buy gifts for others. This weekend we have TWO weddings to go to and we are making these as gifts. However, we couldn't find any coffee cans like the one here, so we are using plastic paint cans that we got from a craft store. Check out my blog next week to see the finished product! That is such a GREAT idea! I love it! Thanks for sharing the date ideas too! what size and type of can did you use? I used a number 10 can. You can generally find them at bulk stores. Love these ideas! I'm going to use the Date Can at my future sister-in-laws bridal shower. I thought it would be fun idea for other people to add ideas of dates! I'll probably include a lot of the ones you already have listed too :) Thanks for sharing! Thank you for sharing this wonderful idea...my hubby and I will be empty-nesters in a couple of weeks (both girls graduated high school this year!) and this will be the perfect thing to start our 'new life' together! I'm making it for our anniversary, which is in June! Just wanted to say thanks so much for the great idea! This will be perfect for my niece! Just want to say thanks for the great idea! It will make a wonderful present for my niece and her husband to be! Such a great use for old coffee tins. The ideas could be endless. Thanks for the cute idea!! What great ideas, I really liked the one about preparing cards all in one day and filing them for later! I love the people in my life but sometimes end up throwing something together last minute that I wish I'd put more thought into. Another idea would be to preplan the party you want to throw for them and file your plans along with the card, then make a memo in your day planner to check the file the week before so you remember to start prepping for it.